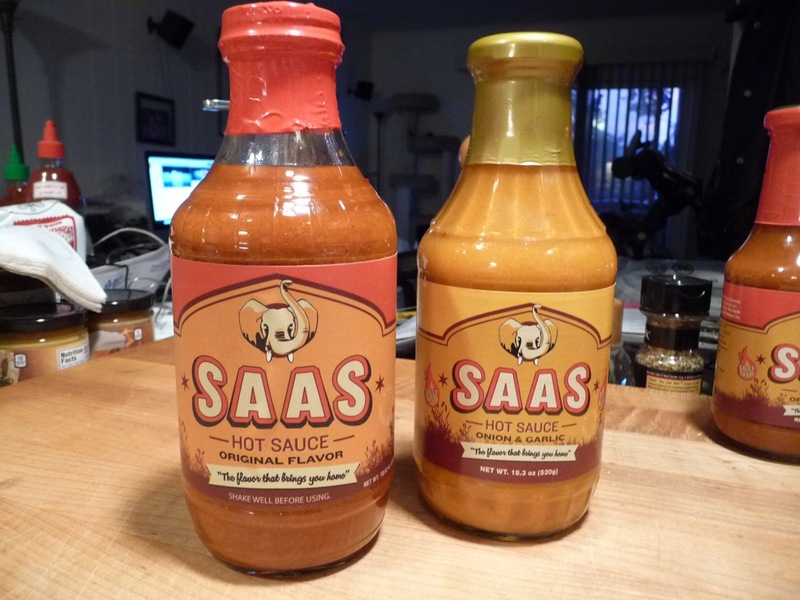 SAAS Hot Sauces are some very unique sauces that fall into the category of “Sauces I’ve Never Heard of But Need to Try!” These are a couple of the most unique hot sauces that we’ve reviewed in a long time. 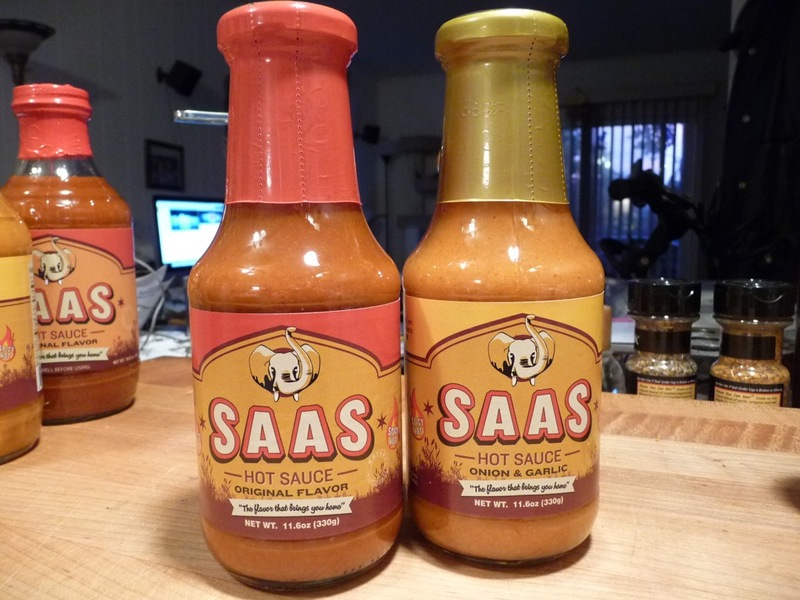 SAAS Hot Sauce (pronounced “Sauce”) also has a great back-story – but more on that later. 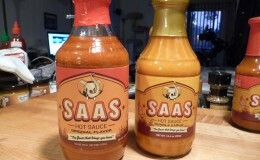 SAAS Hot Sauce “the flavor that brings you home“, comes in both Original, and Garlic and Onion flavors – and both are labeled “Hot and Spicy”, which should make some chileheads very happy. 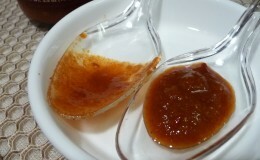 They also offer a Mild version, which we did not try. Ingredients: distilled vinegar (diluted to 4% acidity), cayenne peppers, onions, red habanero peppers, spices, salt, sugar, granulated garlic and molasses. Texture & Appearance: There’s a lot going on here. The color is a very dark orange and there are lots of pulpy bits with some tiny hulls and seeds. 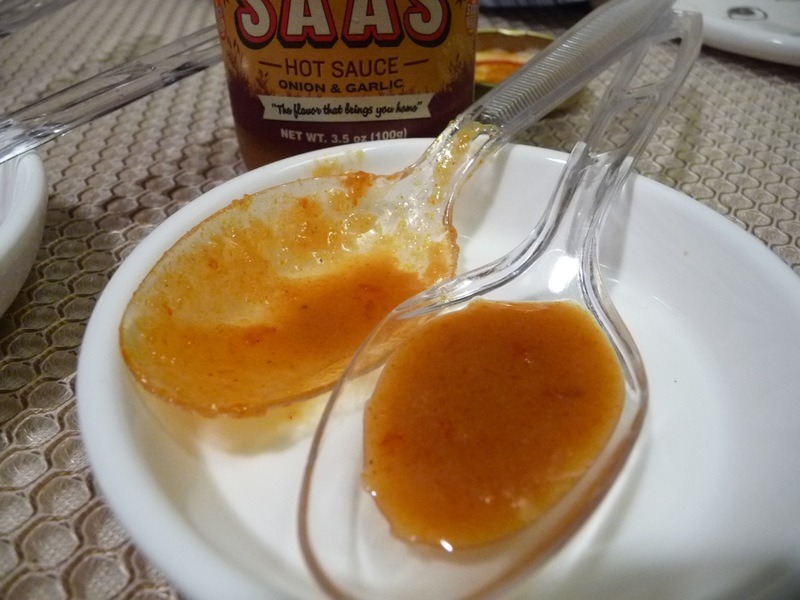 This sauce is thick – not pourable, but very spoon-able. 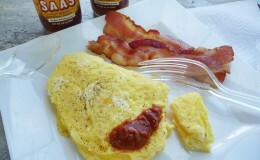 Almost gloppy in thickness (think Heinz Chili Sauce), this is a thick hot sauce! 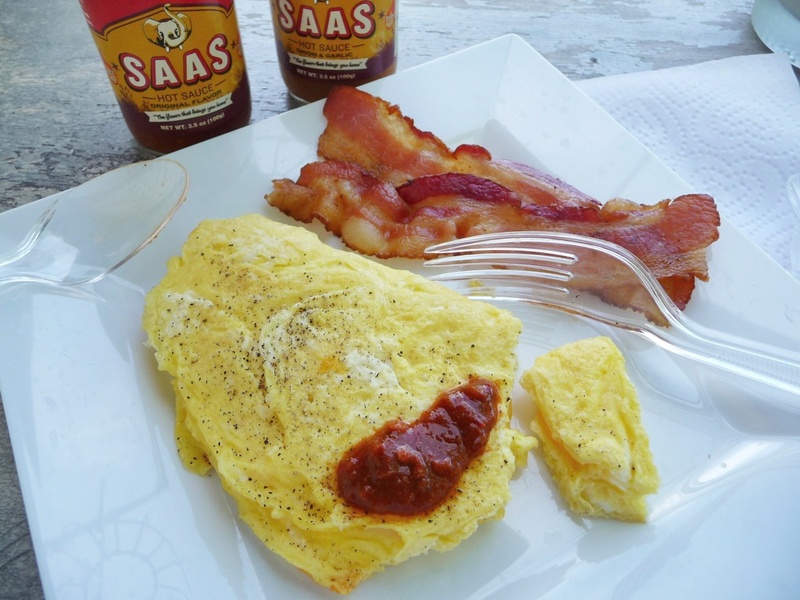 Taste Straight Up: SAAS Original has a kicked up cajun flavor from the cayenne peppers, with extra heat from the red habaneros. 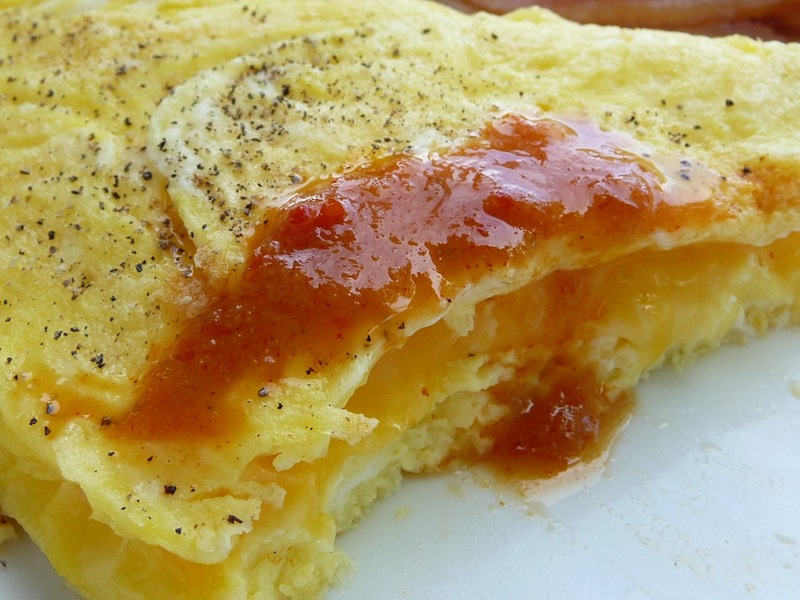 Fans of fiery cajun sauces and cooking will love this sauce. 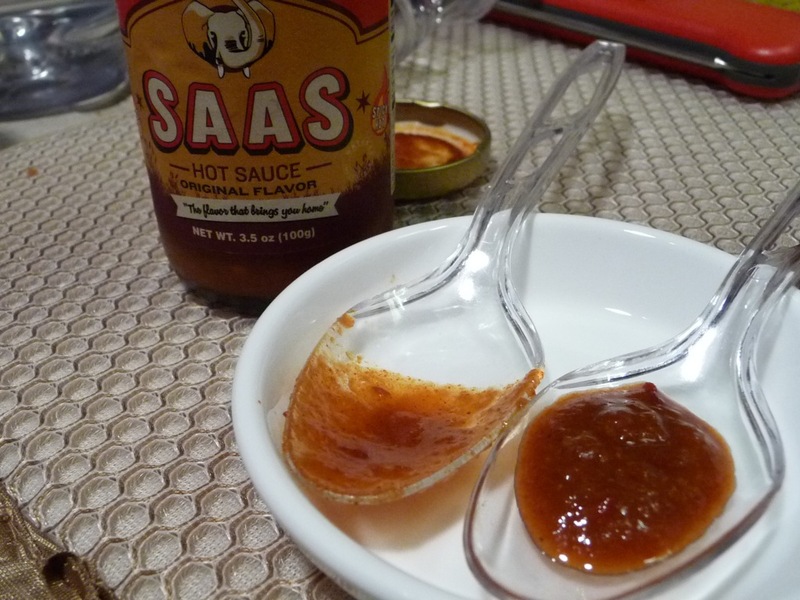 I’ve never been a fan of the straight up cayenne/vinegar/salt sauces, but SAAS brings so much more to the table here, with big flavor and a hint of sweetness from the sugar and molasses. First up is the vinegar (of course), and just a hint of salt with a bit of sweetness, followed by some nice light onion flavor. Then the heat kicks in. Quickly. It even tastes “dark” like its color. Very flavorful, hot, and savory. 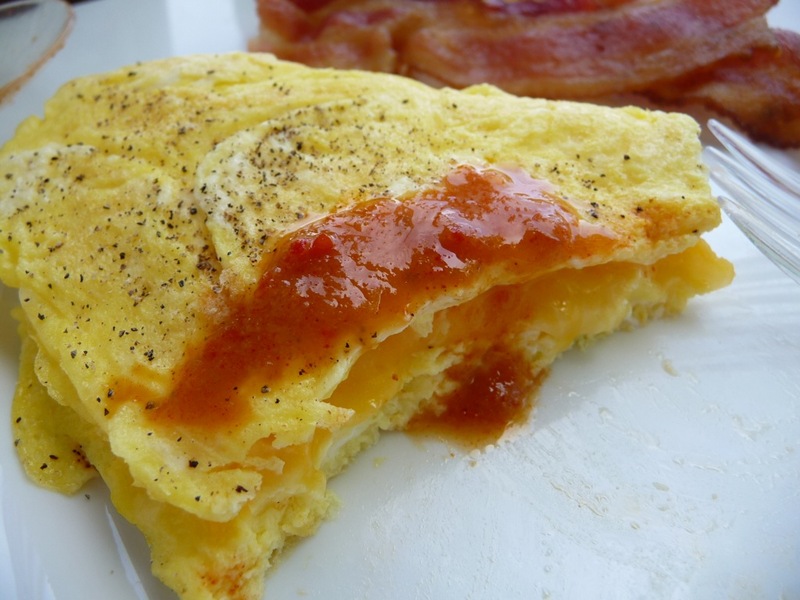 Heat Level: 3.5/5 – The mix of cayenne and red habaneros really bring on some fiery heat. 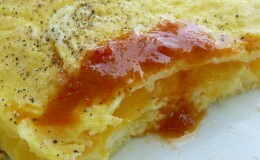 The heat filled my mouth and lips quickly, but lasted only until I was ready for more – so it’s relatively short-lived. 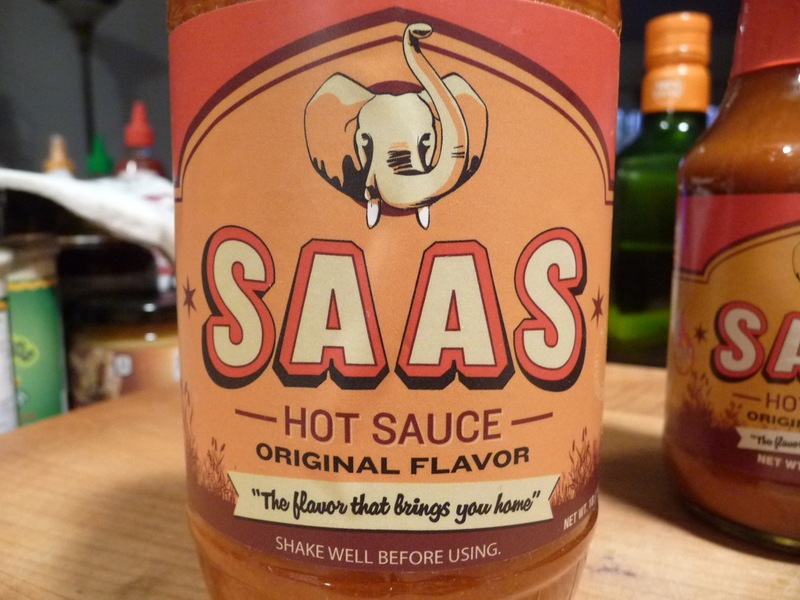 Label/Graphics: Big letters proclaim “SAAS” (SAUCE), followed by the words “Hot Sauce” and their slogan “The flavor that brings you home“. While I like the simple graphics and label, it really does look very “corporate” – like any other bottle on a shelf at your local grocer. Yet, as a fan of hot sauces, you would be challenged to NOT grab these bottles to bring home and share with the family – “Look at what I found at the store!“. Overall Rating (Taste on Food, Final Thoughts): 5/5 – Our top rating for overall taste, quality of ingredients and packaging. 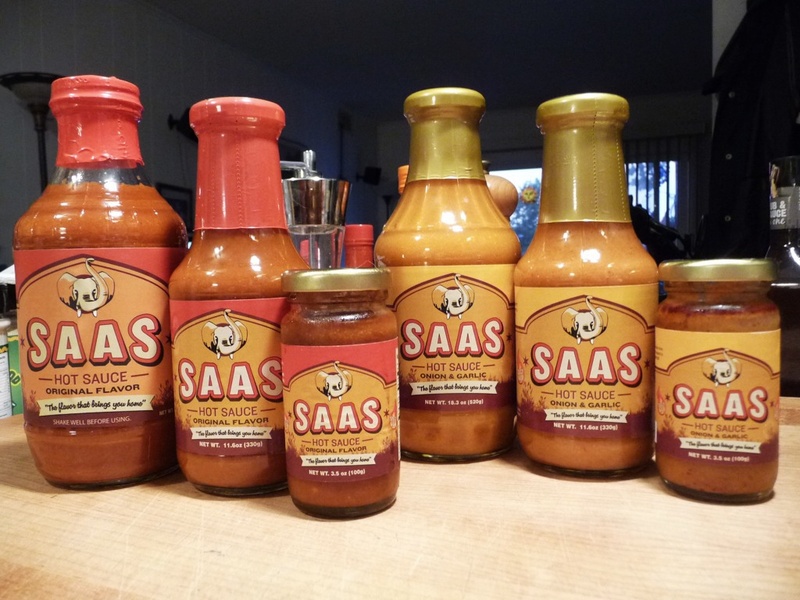 SAAS Hot Sauce has really nailed it in every category. 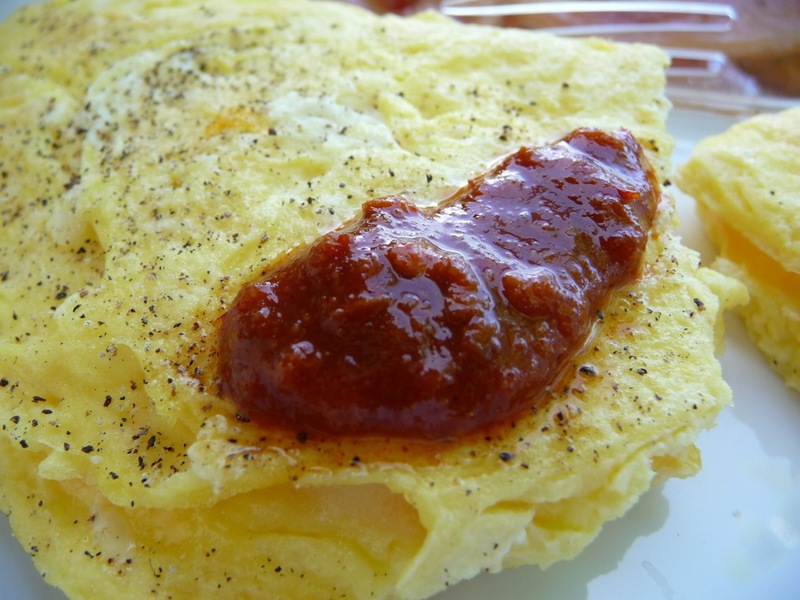 This is not a “try it once” sauce – you will go back to it again and again. 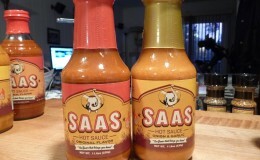 SAAS on pizza. L-R original, onion and garlic. Ingredients: distilled vinegar (diluted to 5% acidity), onions, red habanero peppers, sugar, salt, spices, granulated garlic, honey. 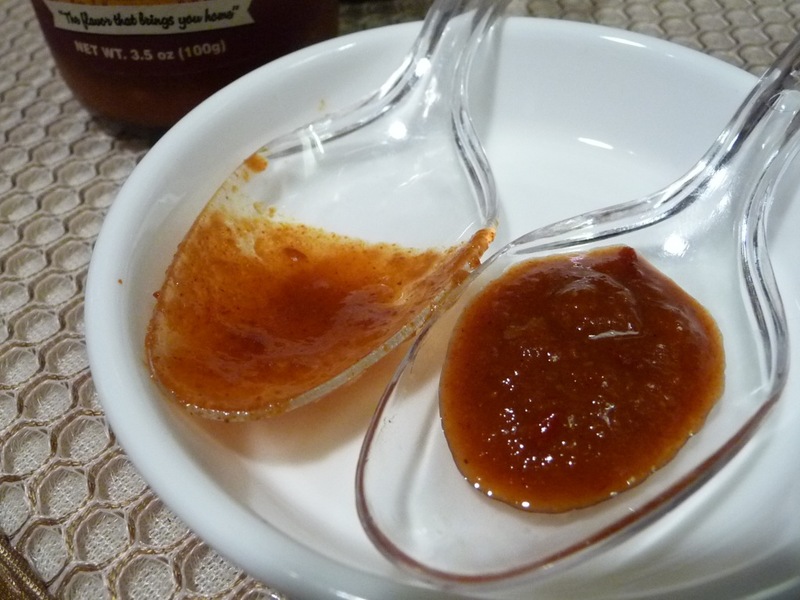 Texture & Appearance: With a much lighter orange color than the Original, there were pools of red that I thought were oil, but are probably the honey. The Onion and Garlic flavor is also much thinner, and therefore more pourable. There are still some seeds floating about. I’ve talked to many a manufacturer about this issue. Apparently, filtering out the seeds and hulls is an expensive operation that many do not employ for cost reasons. I’m sorry it expensive for them, but I want to go on record as not liking seeds in my sauces. 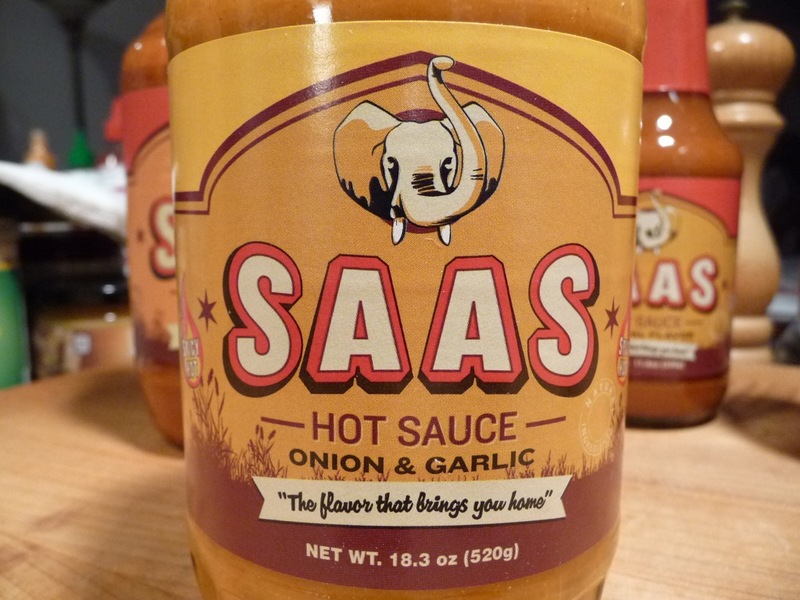 Taste Straight Up: SAAS Onion and Garlic is not a one-note sauce by any means. 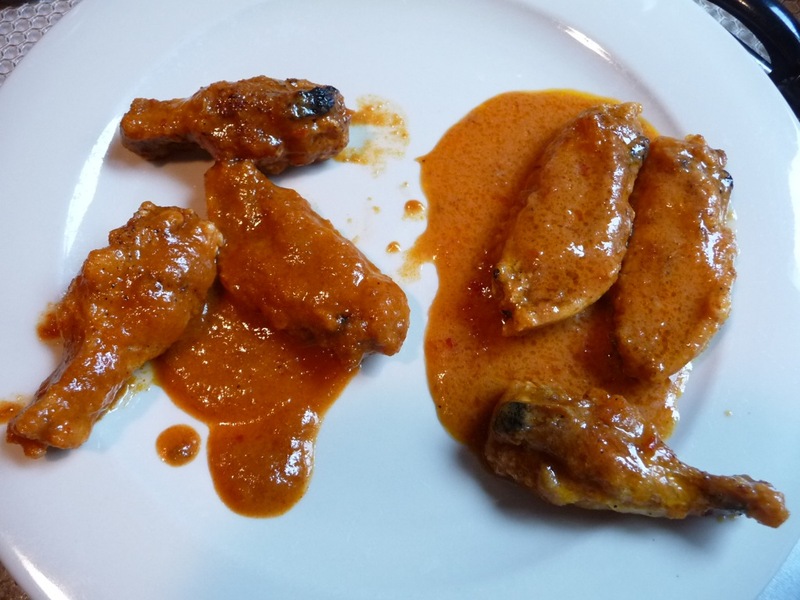 This sauce just screams “wing sauce”! 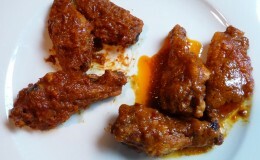 Straight up, it tastes, smells and just feels like a wing sauce. An amazing flavor, I just love this stuff. My favorite of the two, by far. Big onion flavor up front, with a savory and spicy middle taste… the vinegar here is muted slightly by the other spices and flavors. 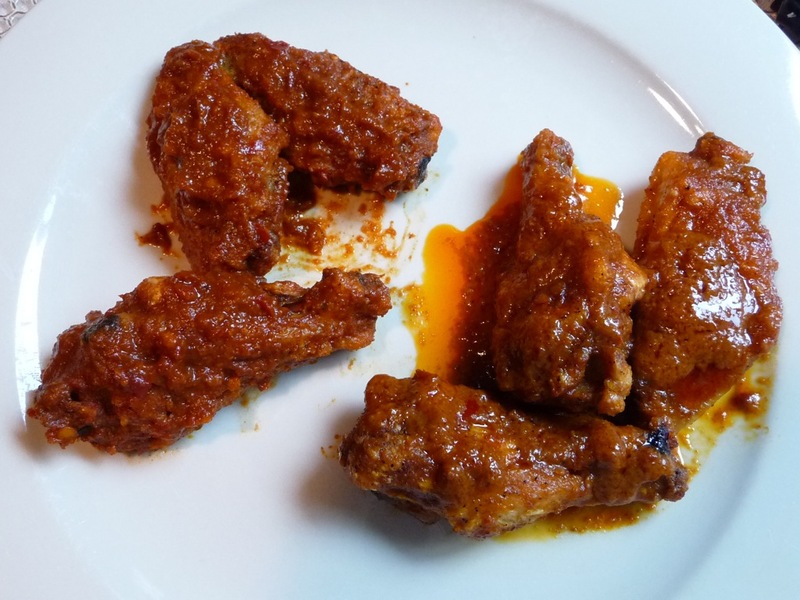 It’s perfect for wings, nachos, pizza… you name it. Heat Level: 2.5/5 – A nice, tingly heat – the heat sits nicely on my tongue. Just dancing around the front of my mouth and lips. It’s onions. And garlic. And hot sauce. Get it? Label/Graphics: Same label with an orange/yellow background. 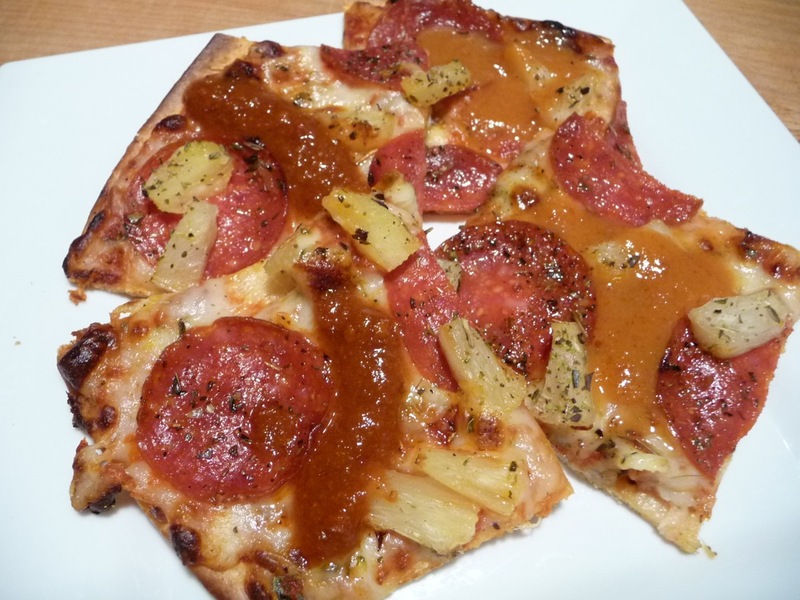 Overall Rating (Taste on Food, Final Thoughts): 5/5 – Since I’m a sucker for good garlic based sauces, and the onion is a bonus, this sauce gets our highest rating. 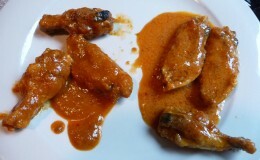 Both of these sauces made for some delicious and fiery wings! I did a batch with just the sauce and with sauce and butter (2:1 sauce to butter ratio). Stop reading now and click one of the links below to order some. Yes. Now. It’s that good. We have a contender for a top 10 sauces of 2013 right here. You read it here first. 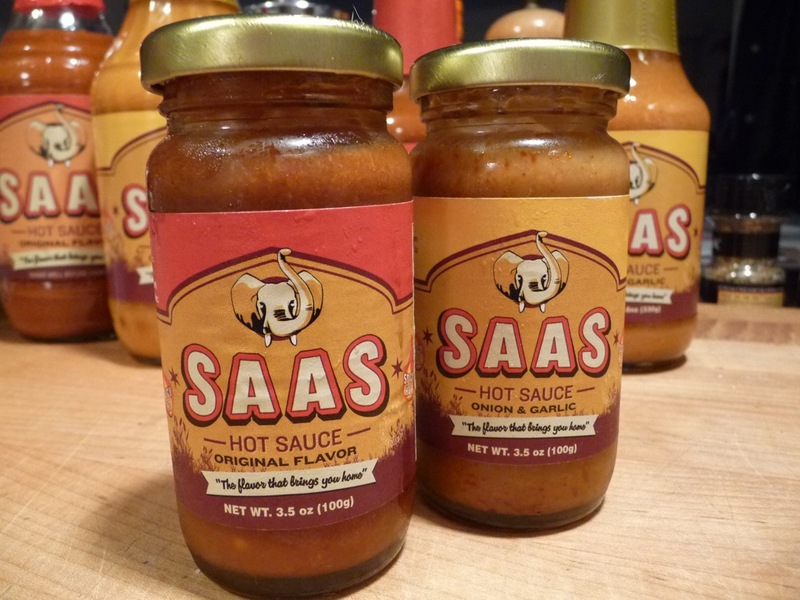 I had a very nice chat on the phone with Mia Rebel, one of the creators of SAAS, and she kindly told me of the beginnings of the SAAS story. 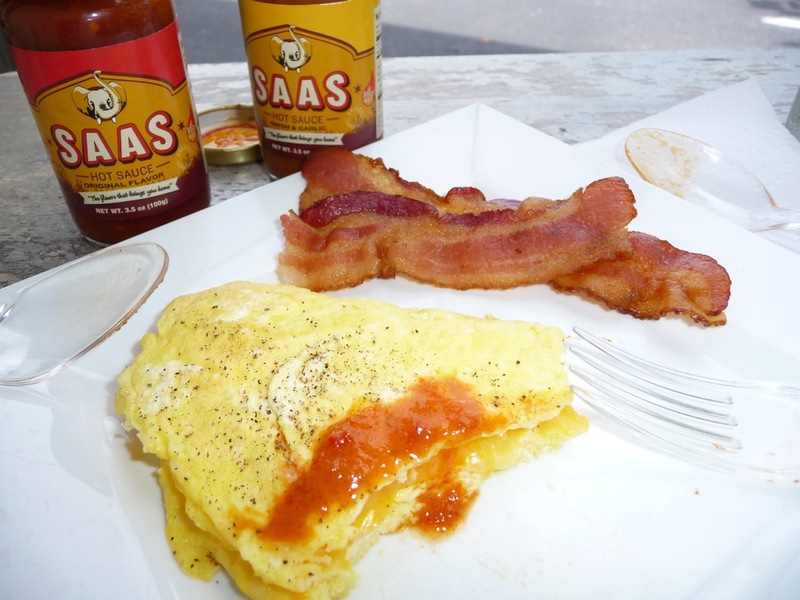 Originating in Africa and India, the SAAS hot sauce story made its way to America where a group of students at the Earth Center Schools got serious about making the sauce as a way to help raise funds. The elephant in the logo is an homage to their beginnings – the elephant was ever-present in their surroundings. In 2008, a team of students were brainstorming to come up with ideas on how to make money for good causes. The primary focus was to generate money in order to help protect traditional culture worldwide. The group of students had a variety of skills between them, and it just so happened that one of them was a sauce chef. They decided to use his zest for sauce making, and in a collective effort, designed this delicious sauce for the benefit of humanity and the earth. 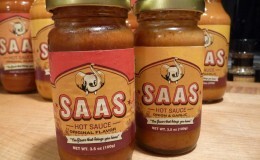 That is the story of SAAS “Original Flavor”. 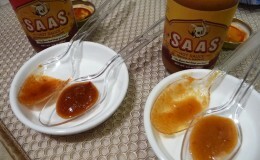 These students, from the Earth Center Schools, developed the original SAAS Hot Sauce, and later the SAAS Onion & Garlic Hot Sauce, and finally the Mild flavor. In 2010, two musicians combined their skills in order to write a variety of musical compositions. While promoting an onion festival in the southern US, they designed an onion flavored hot sauce that would be perfect for families and cook-outs. One of those musicians happened to be part of the team of students that founded SAAS “Original Flavor”! 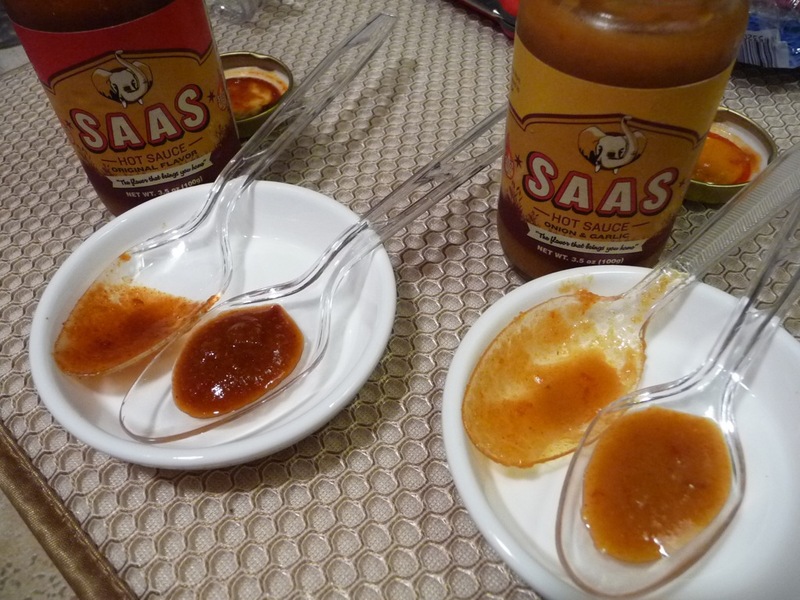 Shortly after, this new delicious onion sauce joined together with SAAS “Original Flavor” in the effort to benefit humanity and the earth. That is the story of SAAS “Onion & Garlic”. The Earth Center of Maanu Inc., is a non-profit grassroots organization, dedicated to preserving indigenous culture worldwide. 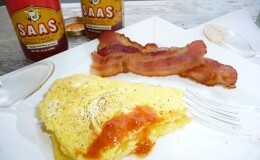 All proceeds (100%) of the SAAS Original Hot Sauce are donated back to the Earth Center Schools and Maanu. Fifty percent (50%) of proceeds from the Garlic & Onion, are donated back. You’ll never buy Hunt’s Manwich Sauce in a can again. This is my homemade version of Manwich Sloppy Joes that I’ve been making at home since I was a teen. It is so simple, and as Brian says, “it’s the bomb!”. 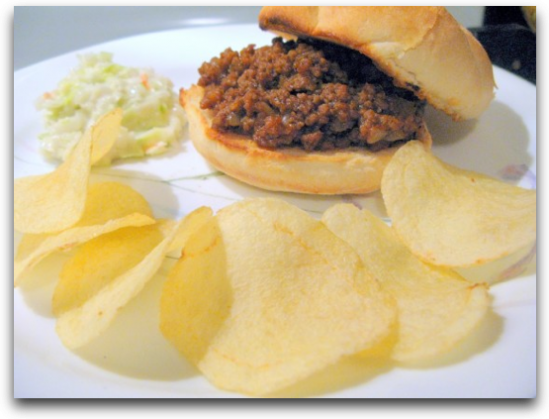 This is a recipe using 2 lbs of ground beef. You could use 1 lb, but this is so good, and freezes so well (if it makes it that far) that you should go with the 2 lb version. I use my Le Creuset dutch oven, but a large cast iron skillet works as well.